Rebel Silencers is a company that has been around for a decent while, but recently, I heard of them for my first time. 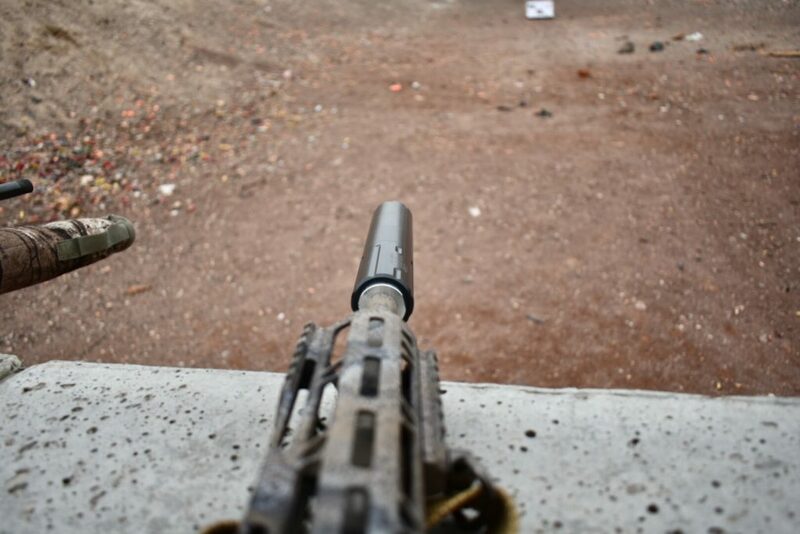 When I saw what they had to offer at the price that they were offering it at, I had to get my hands on one of their suppressors and put it to the test. The suppressor that I chose is the SOS-450; a can that they designed specifically with the 450 Bushmaster and 458 Socom in mind. 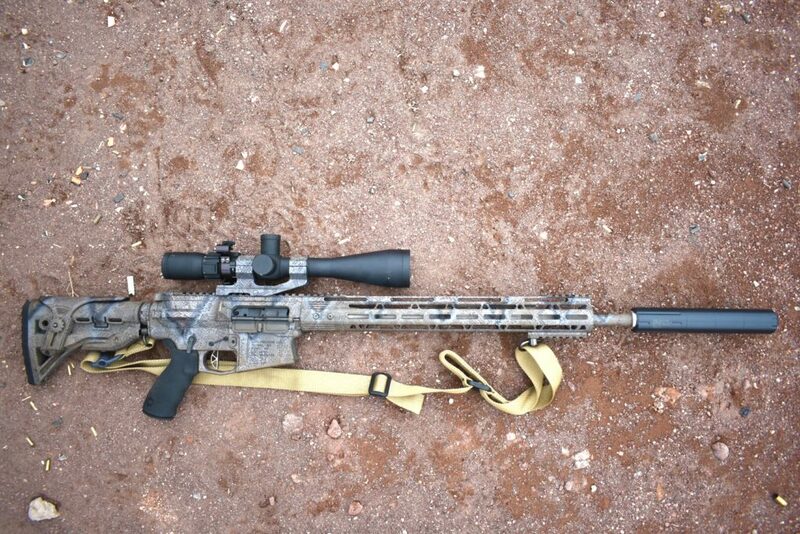 Luckily for me, I just so happen to have a 450 Bushmaster that I wanted to hush. The other reason I fell in love with this can’s design was because I could access each baffle for cleaning. This allows me, in theory, to be able to shoot dirty rimfire ammunition and cast lead bullets through it without worry of plugging it up permanently. Yes, I realize that a 45 caliber baffle stack is not ideal for suppressing a 22 caliber, but anyone who has used one in this fashion can attest that it is infinitely better on the ears than unsuppressed. The SOS-450 is designed in a way that makes it very user configurable. With the help of a wrench, you can change the direct thread adapters out for basically any thread pitch. The SOS-450 comes in the box with three popular options; 1/2×28 TPI, 5/8×24 TPI and 11/16×24 TPI which is common for large bore guns. 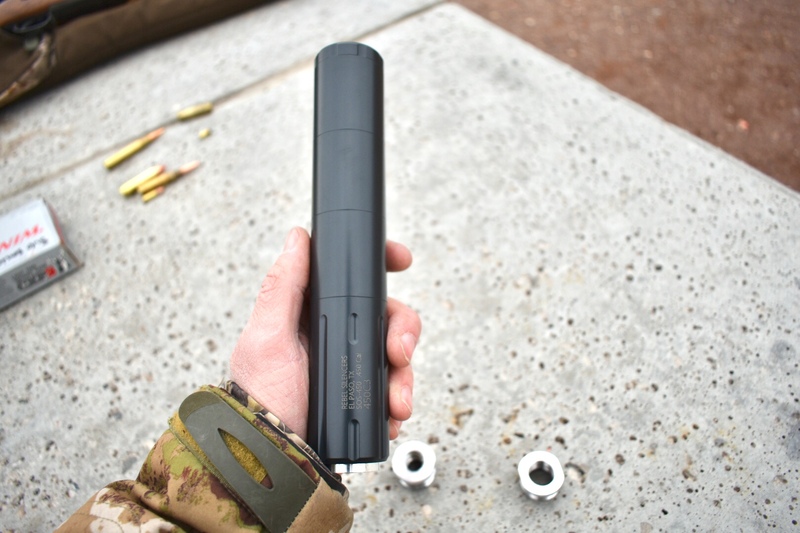 As mentioned, this suppressor utilizes a “screw on stack” design which eliminates the need for an outer tube which cuts weight and allows the user to add or remove baffles for whatever reason they may want to. This can is 7075 aluminum with 17-4 stainless steel baffles which makes for the perfect balance of rugged and lightweight without the cost of paying for the precious metal. In this design, the blast chamber is the serialized part, so if you were to have a baffle strike, Rebel Silencers could just install a new baffle stack and get it back to you within a week or two instead of having to wait for a new tax stamp. 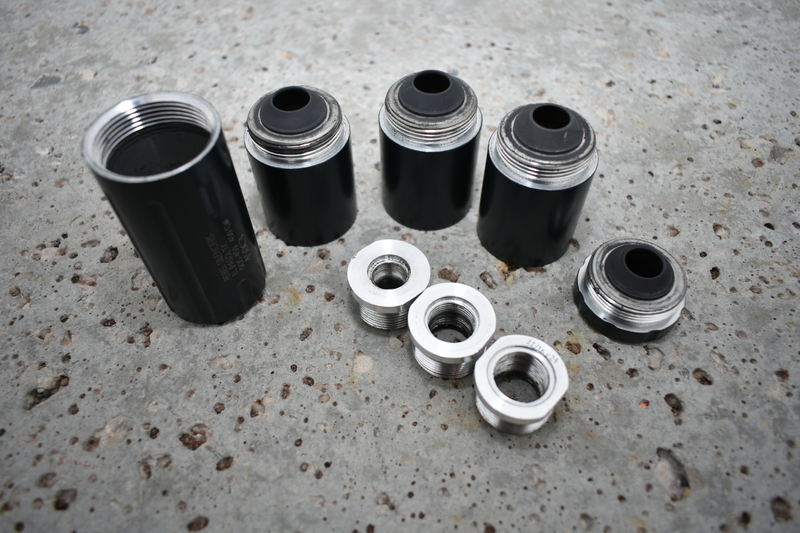 The “screw on stack” design that Rebel Silencers uses eliminates the need for an outer tube and allows easy access to the baffles for cleaning. I did not experience any of the baffles coming loose through the course of fire, so I would say that this should not be a concern for those of you who may worry about it. As mentioned in the title, this lightweight can is capable of withstanding the pressure from the venerable 338 Lapua. 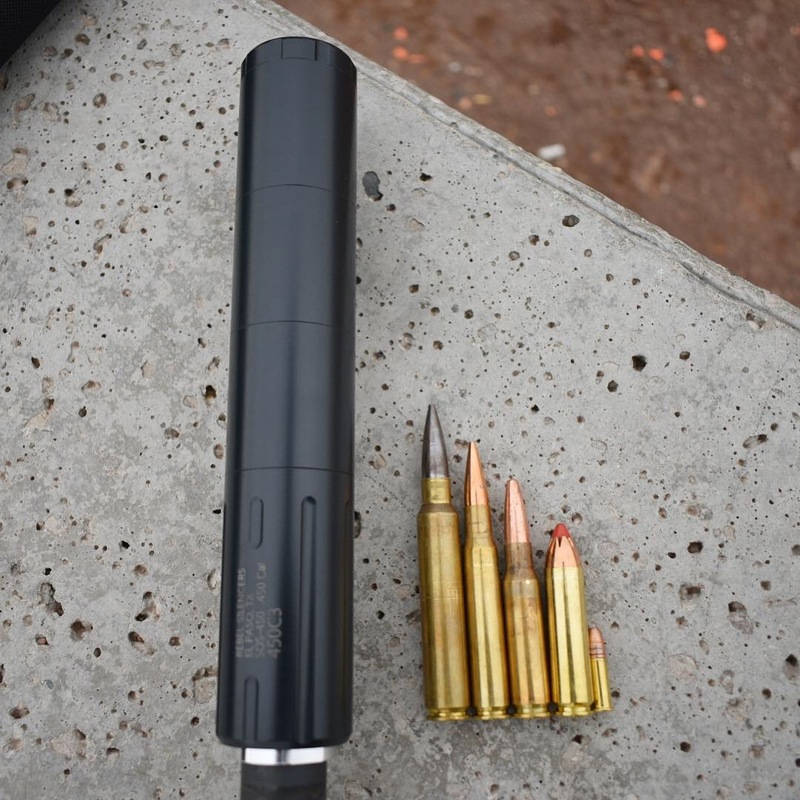 After talking to Rebel Silencers about what this suppressor is able to handle, they told me that it can withstand basically any cartridge that fires a projectile 45 caliber or smaller. This honestly blew my mind. However, I did not take their word for it. Instead, I went out with their promise of my safety and tested these claims out myself. Out of curiosity, I asked Rebel Silencers if the SOS-450 can be modified to shoot on a semi-auto pistol (because a booster needs to be added). Their response was basically “hell yes.” I am told that for $100, they will modify the blast chamber for accepting their booster assembly and send it back to you, with the booster included. Yes, I realize that I could just buy a 45 caliber pistol can, but the option is there and I think I might take advantage of it just because I can. Only weighing in at 9 ounces, the SOS-450 is hardly noticeable on the end of the gun. I brought a backseat full of guns out to the range and shot them all with the SOS-450. This bunch of guns consisted of 22lr, 308 Winchester subsonic and supersonic, 450 Bushmaster subsonic and supersonic, 30-06 and 338 EDGE (a ballistic twin of the 338 Lapua). I felt that this test more than covered the range of conventional calibers. The conditions for shooting were less than ideal due to the other shooters that were out that day, but I had to make it work. This means that I was required to wear earplugs for my own safety despite having the suppressed guns. I was still able to notice that the 22lr was freakishly quiet, as normal for this suppressed cartridge, despite shooting it through a 45 caliber baffle stack. I also noticed that the subsonic rounds I fired through it were very quiet as well. I would most closely compare this can to the SilencerCo Hybrid 46 as far as capabilities go. However, in the sound test, I would say that the SOS-450 would be outperformed by the SilencerCo Hybrid. However, coming in at less than half the price, I was elated by its performance. But I will leave the SOS-450’s performance to your interpretation: Here is the video of the test. In the hand, the Rebel Silencer is just as good looking as it is on the end of the gun. Hearing is an important thing to have and an easy thing to lose. The SOS-450 brings most calibers down to hearing safe levels which help people like myself keep this precious sense. I am totally impressed by the SOS-450 for a couple of reasons: its tiny $300 price tag and its extreme versatility, lightweight, and modularity. Currently, there is no suppressor on the market that I am aware of that can compete with the SOS-450’s capabilities at its price point. The sound suppression was great across a range of different calibers, including subsonic and supersonic rounds. In the end, the toughness of this suppressor totally blew my mind. I fired string after string of quick semi-auto fire and I did not get the can to heat up significantly. I blame this on it being a very cold and windy day coupled with aluminum’s ability to conduct heat, thus keeping it cool. I’d have no problem highly recommending this suppressor to a fellow gun enthusiast, especially those who are budget minded. Impressive sound reduction for a $300 can….basically for hunters (wouldn\’t trust durability for long semi-auto bursts), but a lot cheaper than what\’s out there. Silencerco Omega is my go-to can for 6.8SPC up to 300WinMag, but costs 3x this amount, plus they ding you on the various adapters, end-plates, flash suppressors, etc. I modified an old Mack Bros suppressor with a built-in muzzle brake to handle my 450 BM, but that cost me an extra $700! I know they say it ships with 3 TPI adapters: 1/2×28 TPI, 5/8×24 TPI and 11/16×24 TPI. But what is the base TPI of this thread adapter? Is it 3/4X24 TPI? It kind of looks like it. Then it would fit even another series of rifles (ie: Ruger RPR Magnum series). So given these 3 adapters are a just TPI adapters, adapting them from some unknown, larger TPI to the 3 smaller known TPI’s (1/2×28, 5/8×24, & 11/16×24), what is that base TPI? If it’s not 3/4X24, hot do we get that TPI adapter? It may be able to handle 338 Lapua but I wouldn’t expect it to last long. The 338 is a beast of a round.